In stock black and Stainless/Gray colors only - Genuine from Vision. This is not your normal Twist battery, it is on step up from revolutionary Vision Spinner battery now with massive capacity of 1650mAh and still keeping the size of battery with in nominal range. Vision Spinner range don't need much explanation and Spinner II is even better with new body and stylish colors. 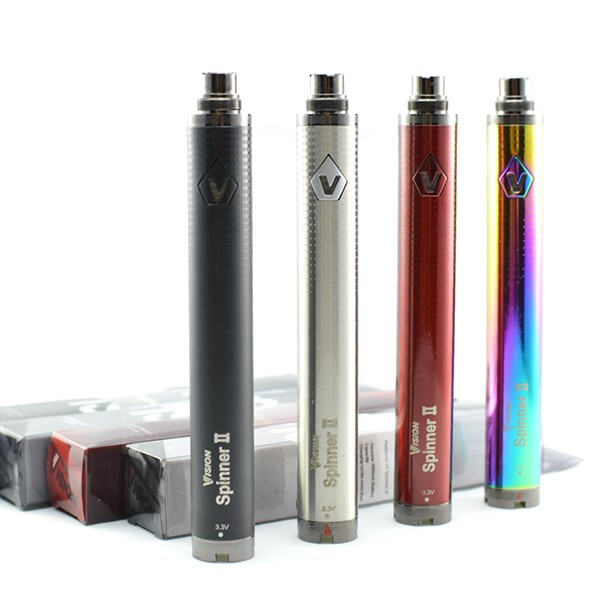 Apart from cosmetic changed Spinner II has upgraded battery cell and internal PCB circuit to deliver constant variable voltage, offering Variable Voltage with a 3.3-4.8v range. Just like regular Vision Spinner Twist, this battery features variable voltage output with 510 and eGo threading to suit most atomisers. The battery offer variable voltage in an eGo sized format. Spin the bottom dial and tailor the vape to just the way you like it. The Spinner II 1600mAh Twist has a lot of improvements from the ﬁrst generation. We have combined all the features and advantages of the ﬁrst generation but at the same time created a totally new unique Spinner II. - Brand new and upgraded battery cell of 1600mA, which makes the Spinner II even more powerful. - Longer life span for the new upgraded PCB and battery cell More so, we took the suggestions from our respectful customers that we do not only supply single Spinner II battery but also a Spinner II kit. The kit is one of the most powerful and useful for all vapors. • When the battery is on, the button ﬂashes three times in mixed color to indicate that battery is off after pressing the button ﬁve times in two seconds ! • Charging time - Spinner II, for its large capacity of 1600mA, requires about 5-6 hours to be fully recharged if the the battery has no power at all.